One autumn night in 13th century Japan, a samurai named Aoto Fujitsuna was crossing a river when he dropped about 10 sen worth of coins. Fujitsuna summoned laborers and offered them 3 kanmon — about 1000 times worth what was dropped — to look for the coins, which one of them eventually found. Fujitsuna rewarded this man separately and said before leaving, “If the dropped money is left there, the country’s assets are lost by that amount, but the 3 kanmon paid to the laborers will circulate in society and would not be wasted.” People laughed at his idiocy of searching for the dropped coins by paying about 1000 times the loss. The laborers, excited with the unexpected gain, held a party. The man who discovered the coins boasted that it was actually a lie: he just handed over the coins he already had and pretended that he had found it. One of the laborers who were listening stood up and left, refusing to approve of the misconduct. After the incident, the news of what had actually happened eventually reached Fujitsuna. Fujitsuna found the man who fooled him and under strict surveillance, took away all his clothes and forced him to keep searching the coins. The season turned from autumn to winter, and on the 97th day from beginning the search, all coins were discovered. The righteous man who left the party was also found: he turned out to be of samurai origin but had been living as a commoner due to a certain reason. On this occasion, he was given back an official samurai position. The above is a story in Buke giri monogatari (Stories of samurai faith), which is said to have been written by Ihara Saikaku in 17th century Japan. This story features an advanced theory of capital circulation, as well as an active fiscal policy similar to that of Keynes’. Actually, a significant portion of public investments in Japan lacked clear necessity. However, apart from their direct effect or meaning, the huge amount of money put in the projects were assumed to lead to expansive reproduction of the economy. In that sense, their cause is nothing different from the logic Fujitsuna expressed. The 3 kanmon which entered the consumer economy through the party may have served to boost the economy. 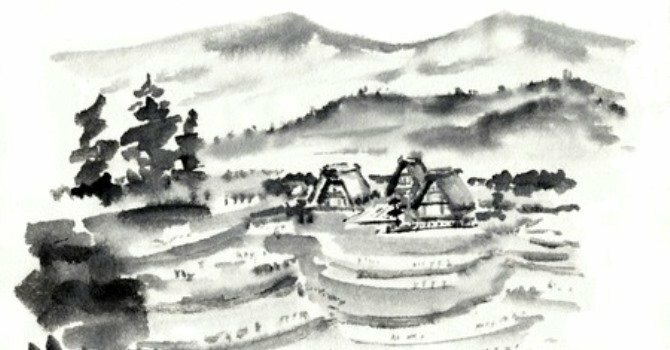 But the reproduction in Fujitsuna’s act was not that of capital but that of the class system supporting the rule of samurai. It is very symbolic that the samurai who had been downgraded to a laborer was assigned again to an official samurai position. In reality, the public investments in Japan were also something similar. It cannot be denied that there was certain economic effect as the result of leaving a massive public debt. However, what was the purpose of those countless roads questionable of their utility left alongside those debts? It may have been that their purpose was to protect the old-fashioned ruling system.